Gun safes are often an afterthought. They’re expensive, bulky, difficult to move, and a pain install. Many gun owners simply forego them completely in favor of a locking gun cabinet made out of wood (which offers no security at all) or constructed from thin sheet metal (which offers only slightly more) with a keyed lock that is easily picked in less than 30 seconds. Gun safes do more than keep your firearms and other valuables away from curious fingers. Most people get them as a theft deterrent, and this is a very good reason to have one. But beyond keeping guns out of the hands of criminals, most quality fire safes also serve as fire protection for sensitive or irreplaceable documents, cash, jewelry, and other high-value items. JayG and Robb have both been talking about safes, primarily to keep guns away from children. Robb mentioned a StackOn Safe, which is good for that, but as mentioned above, is easy for a thief to break into and offers zero fire protection. Image courtesy of AGunSafe.com. Click to see additional larger photos. Take a look at this image to the right. 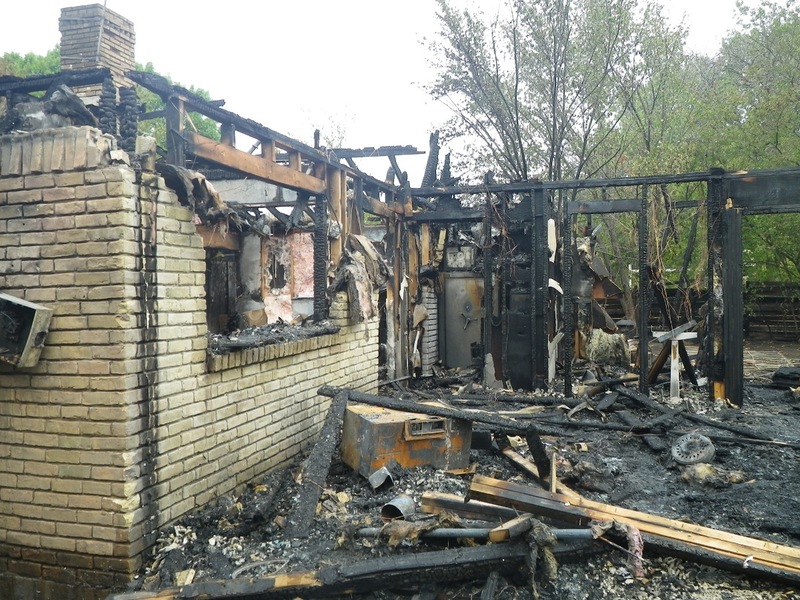 This house burned completely to the ground, but the home owner had a quality safe manufactured by Champion. Most Champion safes have some level of fire protection. I don’t have the details of which model safe this was, but it appears to have one of the higher fire ratings. Safe fire protection generally consists of insulating panels in the safe body, and a thermally activated seal surrounding the safe door. Safes are fire rated depending on how long they can withstand fire at a given temperature while keeping the inside relatively cool and the seal uncompromised. 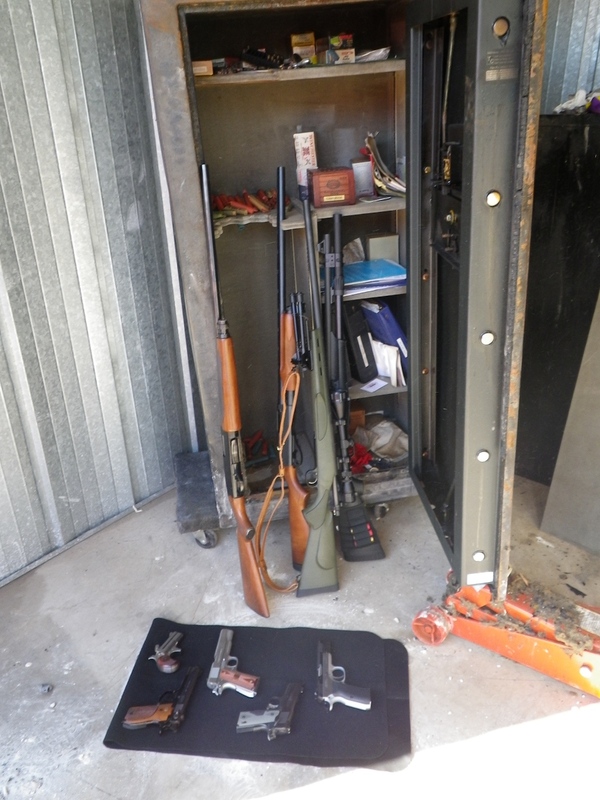 When opened, all of the guns and valuables inside the safe were found still in good shape and apparently undamaged. Take a look at the image below to see just how well a quality safe truly can protect your firearms and valuables. Don’t forget to bolt it into the concrete foundation AND the wall studs. I failed to do this with my 800# Fort Knox safe, and it was stolen! Nothing has surfaced – none of the firearms, personal checks, or credit cards. I suspect they never got it open – it’s abandoned in the desert somewhere. That’s a pretty nifty advertisement! I’ve never seen the results of a safe’s trial by fire like that. Despite the success here don’t fully count on a safe to protect your guns from fire, particularly if the door is easy to close (i.e. doesn’t seal tightly). Typically the expanding fire seals only work when the safe gets close to the fire, and the gasses from a fire are both very corrosive and will often get into the safe when the fire is in another part of the house. Safe techs have talked about opening safes after fires and finding guns that looked like they had been stored in salt water for a few years. +1 to @Kevin’s comment. There are a lot of factors that determine how well a gun safe does in a fire. I’m very happy for the owner that his guns made it through this fire. However, you can tell from the remaining structure around the gun safe that this fire was far from worse-case. A well made safe with thick steel and no fireproofing might have done just as well. Before spending money on an expensive fireproof gun safe, I’d recommend reading up on the shortcomings of gun safe fireproofing. They are not built the same way as real fireproof rated safes.